Notes: The Manchester Sheffield and Lincolnshire Railway opened its line from Sheffield (Bridgehouses) to Beighton (Midland) for passengers on the 12th February 1849. Passengers going south and to London changed on to the ‘Midland’ line at Eckington. After 1852 the line had closed and no longer appeared in timetable. The line re-opened and Beighton was back in the timetable in March 1854. The new line was built from Annesley in Nottinghamshire to join the existing Metropolitan Railway which had now reached Quainton Road in Buckinghamshire, where the line became joint Met/GCR owned (after 1903), it returned to GCR metals near Finchley Road for the final section into Marylebone. In 1903, new rails were laid parallel to the Metropolitan Railway from Harrow to the junction north of Finchley Road, enabling more traffic to use Marylebone. Although the new line had now reached London, Edward Watkin was unable to fulfil his ambition as he was forced to retire through ill health.From the outset, the line had to compete with established north – south routes and the first train only carried a disappointing four passengers so the company had to work hard to win passengers from its rivals; with a well managed Advertising campaign and the introduction of a fast and efficient train service the companies fortunes slowly improved although it was never a match for its rival lines. In 1968 the London Railway Preservation Society chose Quainton Road as its new base, the society being renamed as the Quainton Railway Society; this has now developed into the Buckinghamshire Railway Centre covering 25 acres. The Centre boasts one of the largest private railway collections in the country with numerous steam locomotives, many housed in the former listed trainshed from Oxford Rewley Road which was dismantled and rebuilt at Quainton Road in 1999/2000. Too see other stations on the Great Central Railway between Sheffield Victoria and Aylesbury click on the station name: Aylesbury, Waddesdon, Quainton Road (1st site), Quainton Road (2nd site)**, Calvert, Finmere, Brackley Central, Helmdon, Culworth, Woodford Halse, Charwelton, Braunston & Willoughby, Rugby Central, Lutterworth, Ashby Magna, Whetstone, Leicester Central, Leicester North***, Belgrave & Birstall, Rothley**, Swithland****, Quorn & Woodhouse**, Loughborough Central**, East Leake, Rushcliffe Halt**, Ruddington, Ruddington Factory Halt, Arkwright Street, Nottingham Victoria, Carrington, New Basford, Bulwell Common, Bulwell Hall Halt, Hucknall Central, Annesley South Junction Halt, Hollinwell & Annesley, Kirkby Bentinck, Tibshelf Town, Pilsley, Heath, Staveley Central, Renishaw Central, Killamarsh Central, Beighton (2nd site), Woodhouse Junction, Woodhouse*, Darnall*, Sheffield Victoria & Sheffield Bridgehouses. 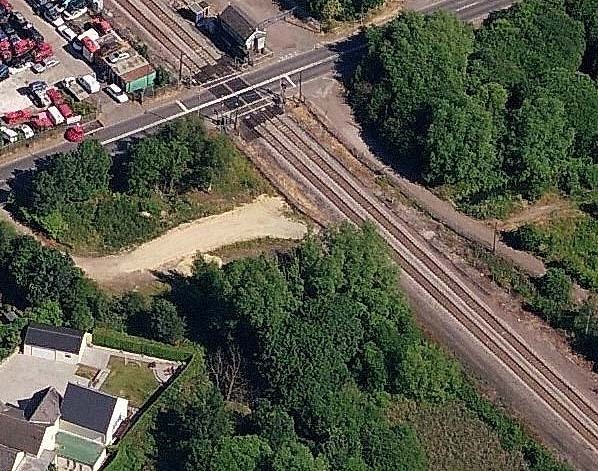 The second Beighton Station was on the north side of the level crossing, the first station was 44 yards south of the level crossing.